Some would call it chance, but Biola’s Talbot School of Theology alumnus Brandon Cash (M.Div. ’98) sees it as God’s will that he was invited to be the chaplain for one of Los Angeles’ major league baseball teams — the Dodgers. “I’d love to say I had this great vision for sports ministry, but the truth is I didn’t,” said Cash, who has been chaplain for the Dodgers since 2010 and also teaches at Talbot. Cash relates his start in sports ministry to Psalm 127, which describes how Solomon received wisdom while he slept. Cash did not set out to be in sports ministry, despite his background as a competitive golfer. He attended Long Beach State College on a golf scholarship, and actually had no intentions of working in ministry. After graduating, however, Cash began to discover a deep desire to learn more about his faith and what he actually believed, which ultimately led him to Talbot. The unexpected theologian dove headfirst into the material, developing mentoring relationships with his professors. “The professors are what made my Talbot education — the theological foundation especially, but it was the relationships with professors that were the best part of my education,” said Cash. One of those mentors was professor Joe Hellerman, pastor of Oceanside Christian Fellowship [OCF] in El Segundo, Calif., and one of the many catalysts for Cash’s current role with the Dodgers. When Cash was about to graduate, Hellerman called him to apply for a pastor of family ministries position at OCF. Cash happily obliged and was offered the job. He later became one of the church’s lead pastors and still is to this day. When the church bought a building right down the road from the practice center of the Los Angeles Lakers and Kings, it proved to be fate for Cash. One of his church members — a trainer for the Kings — took notice when Cash’s love for sports showed through in illustrations he chose when preaching on Sundays. A few hockey games and connections later, Cash was soon leading a Bible study for some Kings players. “You could see how God was putting all these pieces together,” said Cash, reflecting on God’s direction in his ministry. Cash’s journey continued with Baseball Chapel, an international ministry recognized by Major and Minor League Baseball organizations that appoints team chaplains. 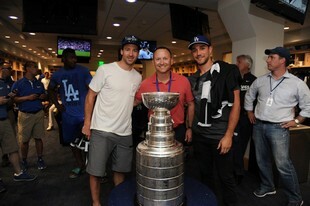 The ministry reached out to some sports ministry connections in Los Angeles to find a local pastor who may be interested in being the chaplain for the Dodgers, and some Kings players passed along Cash’s name. When Baseball Chapel called, Cash accepted the opportunity. 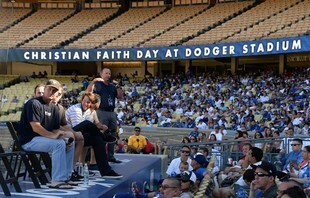 When the Dodgers are in town, Cash leads them in a Sunday service alongside the visiting team, hosts Bible study, and regularly disciples some of the players. While many would see his position as a claim to fame, Cash sees it as a unique opportunity to minister to those that most would have no idea how to reach. Last year, Cash went on a mission trip to the Dominican Republic with Dodgers players A.J. 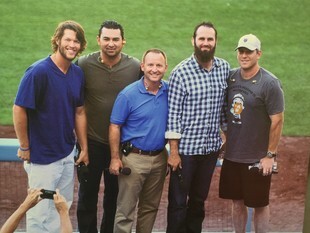 Ellis and Clayton Kershaw, where they led baseball clinics and had opportunities for players to share their testimonies. He has also led Faith Day at Dodgers Stadium multiple times, an event where Cash interviews Dodgers players on top of the dugout about their faith after a game. Approximately 1,500 people stuck around to listen to the interviews in 2011. Last year, about 10,000 people stayed to listen. In moments like these, Cash sees how fruitful the ministry has been and how remarkable his position is as chaplain. Starting this past year, Cash became an integral part of Talbot’s new master’s degree program in preaching and pastoral ministry. He is leading the first undergraduate cohort through the five-year program, which allows undergraduate students to obtain a bachelor’s and master’s degree within five years. Cash will be speaking at the Biola Athletics first pitch dinner with Dodgers’ player Adrian Gonzales on January 21. Learn more about the Master’s in Preaching and Pastoral Ministry program. Brandon doesn’t mention it often but when playing Tiger Woods in Collegiate play...he beat Tiger! He was that good. He blessed my wife Mary and me by marrying us 12 years ago. Many big hugs to Pastor Brandon.